BROOMFIELD - Some 9NEWS tippers couldn't quite believe what they were seeing: a spaceplane soaring through the skies over Rocky Mountain Metropolitan Airport. This spaceplane was no UFO. It was the Dream Chaser Orbital Crew Vehicle being developed by the Sierra Nevada Corporation in Louisville. 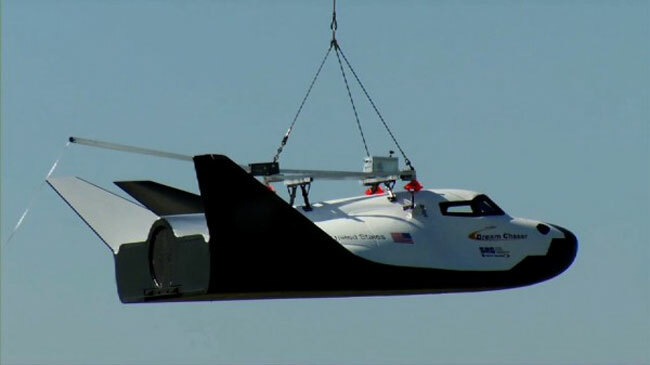 Sierra Nevada engineers were seen checking the spacecraft just moments after testing the vehicle's aerodynamic performance by suspending it under an Erickson Sky Crane helicopter. The Dream Chaser is being developed as part of a NASA program to provide a commercial vehicle for use in low-Earth orbit. Company officials hope to have the Dream Chaser, which began development in 2005, operational in 2014 to ferry crews and cargo to and from the International Space Station. On Thursday, Sierra Nevada executives are planning to brief reporters on how the aerodynamic testing went at their company headquarters in Louisville. Sparks, NV –May 29, 2012 – Sierra Nevada Corporation’s (SNC) Space Systems announces that the Dream Chaser® Space System has successfully completed four additional NASA Commercial Crew Development Round 2 (CCDev2) Program Milestones. The four Milestones included: Separation System Testing, Flight Article Main Landing Gear Drop Testing, Captive Carry Interface Testing, and a Captive Carry Flight Test Readiness Review. Dream Chaser's Separation System Testing served to evaluate the Dream Chaser-to-Atlas V launch vehicle separation system. Such a system will be used to release the Dream Chaser from the Atlas V second stage after the launch vehicle has placed it into low Earth orbit. The Flight Article Main Landing Gear Drop Testing successfully evaluated the performance of the landing gear selected for use on the Engineering Test Article for Approach and Landing Tests (ALT), scheduled for later this year. The Captive Carry Interface Test successfully tested the release mechanism that will be used during ALT, as well as for Captive Carry. During the Captive Carry Flight Test Readiness Review, completed on May 24th, SNC management approved proceeding with the first full scale flight test of the Dream Chaser Flight Vehicle. During this risk reduction test, the Dream Chaser will fly under an Erickson Sky Crane helicopter to verify proper aerodynamic flight performance that will inform future free flight testing. The flight will occur near the Rocky Mountain Metropolitan Airport in Jefferson County, Colo.
“The Dream Chaser Team has made significant progress in hardware development during the Commercial Crew Program. The success of these milestones shows the rapid progress that a commercial company like SNC can make in partnership with NASA“, said Senior Director Merri Sanchez. Sanchez joined SNC after 28 years at NASA, her extensive experience within the agency includes serving as the X-38 Deputy Project Manager. "NASA's Commercial Crew Program has created an opportunity for SNC to create an orbital crew transportation system that will safely and reliably transport astronauts to the International Space Station for a significant cost savings over traditional systems," said Mark Sirangelo, Corporate Vice President and head of SNC's Space Systems. Sierra Nevada Corporation (SNC) is one of America’s fastest growing private companies based on its significant expansion and reputation for rapid, innovative, and agile technology solutions in electronics, aerospace, avionics, space, propulsion, micro-satellite, aircraft, communications systems and solar energy. Under the leadership of CEO Fatih Ozmen and Chairman and President Eren Ozmen, SNC employs over 2,100 people in 31 locations in 16 states. SNC’s six unique business areas are dedicated to providing leading-edge solutions to SNC’s dynamic customer base. Sierra Nevada Corporation’s Space Systems business area headquartered in Louisville, Colorado, designs and manufactures advanced spacecraft, space vehicles, and spacecraft subsystems for commercial and government customers. Space Systems (SS) has more than 20 years heritage in space, successfully delivering over 400 subsystems for 300+ satellite missions. Current key programs include NASA’s Commercial Crew Development program where we are developing our Dream Chaser® 7 passenger vehicle to take astronauts to the International Space Station; the ORBCOMM Generation 2 program that includes production of 18-48 small satellites for a commercial asset tracking company; the SpaceShip2 program where we are developing a non-toxic “green” rocket engine for Virgin Galactic’s suborbital space vehicle to carry tourists to space; and the Modular Space Vehicle program for the DoD’s Operationally Responsive Space Office.